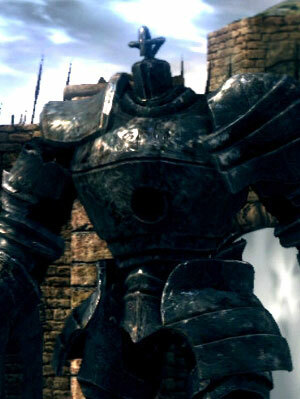 This iron giant, created by using a bone from an Everlasting Dragon, is the guardian of Sen's Fortress, and acts as the gatekeeper of Anor Londo. At the top of the fortress, before the spiral staircase leading to the firebomb-throwing Giant. In the room across the bridge to the right of the boss' fog gate. After killing it, Domhnall of Zena will start selling the Golem Set. It is possible to be picked up and thrown off the arena and survive, resulting in the player being stuck down off the main area. Energy Blast - Swings his axe horizontally, releasing a wave of energy that knocks the player back. Uses only while at range, deals magic damage. Horizontal Slash - Swings his axe horizontally at the target, sometimes followed with a backwards slash if the target moves behind him. Vertical Slash - Swings his axe vertically in front of him. Grab - Stretches his arm out and grabs in front of his legs. If a target is caught, he picks them up and throws them to the ground. Both being caught and hitting the ground cause damage. Stomp - Stomps 2-3 times in a row. Punch - Punches the ground in front of him. If the player is too close, the Golem will jump away from the player. Kill the firebomb-throwing Giant up the stairs opposite the Fog Gate first or he will make the fight a lot more difficult. Do not use target lock for this fight. Angle the camera so that you can see where you are on the platform and can tell which attack the golem is using, and aim it towards his legs. They are broad enough that it is difficult to miss attacks. Locking on will aim the camera far higher and often cause you to miss or walk off the edge. Players still unfamiliar with the game may wish to use lock-on only when using a vertical attacking weapon such as the Iaito Sword. Blocking is highly ill-advised as the platform you get to fight the golem on is tiny and his attacks confer huge knockback even while blocking. More often than not you will find yourself knocked off the edge to your death. Dodging is a far more viable strategy, and the golem is nice and slow to facilitate that. Moving around towards his axe side will cause him to use his axe attacks, which are easy to dodge. Moving towards his unarmed side will generally trigger a grab attack which is very dangerous if it catches you but provides a long window for attack if it misses. Provided he is not doing a horizontal attack, you can run through his legs to get behind him and avoid damage while he turns around. At all times you should be able to run behind him to avoid everything. You can watch a video here. His attacks are slow enough that it is perfectly viable to run up to him, get a few hits in and run away before he has a chance to hit you. Try not to fight him with the edge too close to your back, if he grabs you he is guaranteed to throw you off. If thrown off the edge, you may find that your souls and humanity can not be recovered. As you will not be blocking, two-hand your weapon for extra damage (except perhaps to block his initial projectile attack). You can either try a hit-and-run method of waiting for an attack to miss then running up, getting a few hits in (a running attack by using a light attack while sprinting is a good way of launching straight into an attack) and run away again as he starts his next attack. If he starts walking towards you, you will need to get a bit closer to bait out an attack then back up again. Note that if you deal enough damage to his legs in a short period of time (heavy weapons such as Greatswords or the Black Knight Sword are ideal) he will stagger, swaying from side to side. Dealing enough damage to his legs during this stagger will cause him to fall down, giving you a long time to just stand there and attack. Note that the Lightning Spear is effective but difficult to hit. Its strike area is very narrow so proper positioning can be tricky to achieve quickly. It is best used when he has been staggered or has fallen over. The golem is slow and as such you can bait out an attack, run back and fire your projectiles. Beware of the small arena you have to fight him on and his energy blast attack. Summoning assistance is advised. For a ranged solo kill you can kite him across the narrow walkway until your back is to the wall, then run between his legs and kite him in the other direction. Summoning Black Iron Tarkus makes this fight a lot easier, he will deal a lot of damage and can take a huge amount of punishment. Melee players can stand behind the golem (watch for his stomp attack) while ranged builds have it easy at a distance. Gold Pine Resin adds lightning to your weapon for greatly increased damage. It should also make it a lot easier to stagger him. The Iron Golem has its own mechanism for staggering. This mechanism uses damage dealt against his legs instead of poise like regular enemies. The mechanism has two phases, in the first phase attacks have to deal enough damage towards his legs to bring him in a stagger pose. This damage can be dealed over time. The second phase starts as soon as Golem changes in the stagger pose. Further damage in a short amount of time, before he regains his balance, will knock him over. The HPs of the first phase are about 13.89% of his max HP. The HPs of the second phase are only about 50% of the first phase. Staggering and subsequently knocking over the golem while he has his back to an edge or while he is on one of the narrow paths either sides of the platform will cause him to fall off for an instant kill. You can watch Tarkus do it here. A simple method of knocking him off yourself is using Great Combustion with Power Within active, run up to him at the start of the fight, do not let him onto the platform, and cast away. 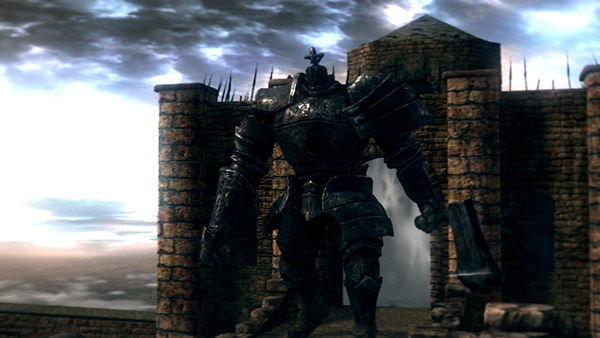 Black Iron Tarkus, left to his own devices, is capable of killing the golem solo on the first playthrough. The grab attack is subject to a bug which causes it to deal no damage when multiple players are grabbed.